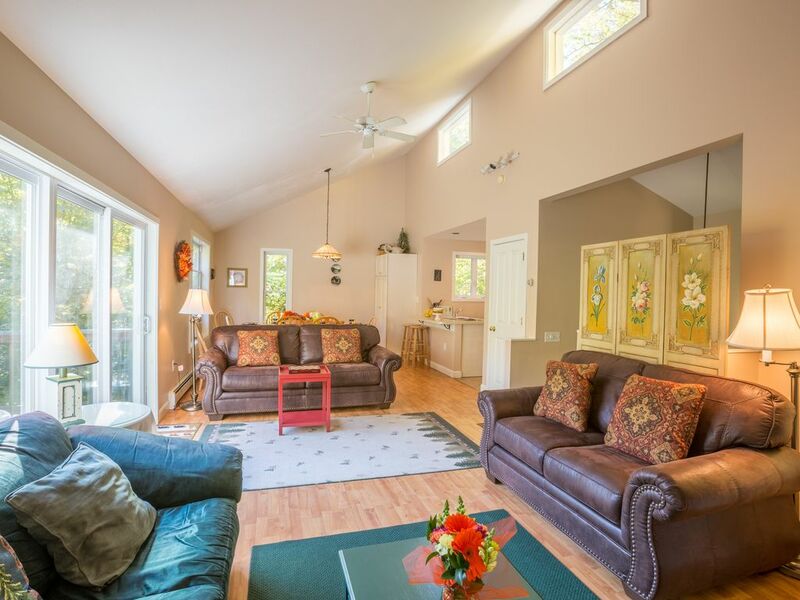 Relax in our White Mountain home--with private hot tub! With its resort-like amenities, private hot tub, and prime location, this contemporary mountain home makes for an unforgettable White Mountain experience. Just ask our previous guests. Situated in the resort community of Waterville Estates in Waterville Valley, our home is truly a retreat from the world. Upstairs you'll find an open-concept design with cathedral ceilings and plenty of light. The spacious living area features a dining table, a big-screen TV, plush couches, and a fully equipped kitchen. The woods are visible from almost every angle, and a sliding glass door opens onto a private deck. You can savor your morning coffee from there while looking out into the trees. We also offer free Wi-Fi so you can stay connected. We have four bedrooms downstairs--two with queen-size beds, one with a day bed and a trundle, and the other with two twins. All of the rooms are spacious and comfortably outfitted. The house can easily sleep up to ten people. We also have a second living room downstairs with an Xbox 360--the ideal hangout for your kids. And no matter where you are in the house, the gurgle of the nearby brook adds to your sense of peace and contentment. All year long, the private outdoor hot tub is the perfect place to kick back and enjoy the view. We also have free access to a multi-million dollar recreation center with three pools, including two indoor pools. In the summer, the community pond has a sandy beach and is stocked with fish. In the winter, the nearby Waterville Valley ski area offers discount lift tickets to our guests. The area also offers ample opportunity for hiking, biking, ice skating, golfing, and horseback riding. 2 indoor, 1 outdoor pools, pond with sandy beach, paddle boats, tennis, basketball courts, volleyball, exercise room, library; stocked fishing pond, lighted skating pond in winter. Discounts on ski lift tickets at Waterville Valley. Very much recommend renting this lovely home from Debs. Local to WV, great location, well appointed house on 3 levels with lots of space for a large family or two staying together. We had a great Thanksgiving time out. We enjoyed the location and our trip to Santa’s Village. We also caught a movie at Barnz with recliners and finished at Guisippe’s Pizza. So many issues!! BIG NO. I am not sure why this property is rated so good. Listing down issues and so decide before booking. 1) Pictures are misleading and if you ask for the house pictures from outside, i am sure you wont book it. 2) Its 3 floor apartment. Ground floor bedroom is super waste and was smelling. 3) There was dead rat in our master bedroom and it was smelling since we checked in. We couldnt able to find the reason initially. Smell was so bad that we couldnt able to sleep in the master bedroom. On last day we found the dead rat. Owner didnt care to inform and infact her cleaner told her that she could smell something before we moved in. 4) There was water leakage in the commode . This complain was raised by somebody else as well.. Leakage was so bad that water reaches the ground floor and ground floor bed was un-usable. 5) Owner expect us the put the trash in the community area. Do you really expect us the put the trash board in our car. What if somebody is coming via sedan car, trash can wont even fit in... Anyways, community area was 1 mile and garbage box was closed and we were roaming here and there with trash in our car.. smelling ..
7) I think somebody else also had issues and asked for the refund, but the owner was least bothered. I am always surprised when I get a review like this where issues that occurred get so exaggerated from the truth. We investigated all the issues. The toilet did not leak but there was a large amount of water on the floor of the shower room from running the shower with the shower curtain hanging outside of the tub. The toilet room is so far from the lower level bedroom its impossible for that to leak onto the bed. The guest did run the washer so packed with clothes that it did leak unto the laundry room floor that ran under the wall and into the bedroom next door wetting the rug and a corner of the bedspread that was laying on the floor. We do ask our guests to take their trash to a nearby dumpster 1/4 mile away ( not one mile away). We provide trash bags, it can be dropped off as needed and its open 24/7. We use ongoing pest control and it does not happen often but a mouse can sometimes die within the house. She did send me a photo of a tiny mouse( not a rat although you have to admit a rat sounds so much worse) found under a bedside table. I expressed my regret that it happened and probably would have offered some compensation except for the fact that my cleaner called me in tears at the condition of the house after these guests checked out. We rented this home for two couples and their two small children (age 5 each). The house fit the six of us perfectly. It was close to local attractions as we went to loon mountain, the flume, and Santa’s village. It also had access to the community center which has great pools. Every time we went to the pool we had the whole pool to ourselves which was great. House is as described with 4 bedrooms and 3 bathrooms. Pictures show the state of the house and has someone come clean hot tub on a weekly basis, we didn’t use hot tub but was appreciated to know someone was caring for it. Perfect place to enjoy a vacation! we loved the place. Our family of 7 had plenty of room. The pools were great and we had the indoor pool pretty much to ourselves. the kitchen was fully equipped and we even made a cake and muffins! Jim was quick to reply to any questions. I hope we can go back next year! We enjoyed a peaceful week here at the end of July. House is just far enough away from reality yet convenient to travel to all White Mountain and Lakes Region attractions. The home was exactly as described. Plenty of room to not be in eachothers way, and the hot tub was a nice relaxing treat! The community center is a 2 minute drive down the road with 4 pools and all sorts of amenities. Definitely a great choice! Minutes to White Mountain attractions, Clarks Trained Bears, Franconia Notch, Whales Tale Water Park. Ski at Waterville Valley, Loon, Cannon, Tenney. Golf at the nearby Owls Nest Golf course. Shop at nearby outlets. View the fall foliage on one of the many scenic roads or up close from horseback. Nearby stable offers trail rides and hay rides.